Itoje has been missing since England’s big win over Ireland, while Robshaw has played just four matches since returning in January. MARO ITOJE, CHRIS Robshaw and Jonathan Joseph have returned from injury to form part of England’s 31-man training squad for the Six Nations clash with Italy on Saturday. Saracens lock Itoje sustained knee ligament damage in 32-20 win over Ireland on 2 February and sat out the victory over France and the 21-13 loss to Wales in Cardiff. 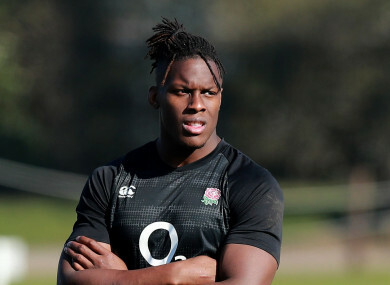 However, with Courtney Lawes ruled out for the remainder of the competition due to a calf injury, Itoje has been drafted in to prepare for the Azzurri’s visit to Twickenham. Flanker Robshaw also returns to the fold on the back of a try-scoring display in Harlequins’ 31-29 victory at Bath on Saturday. The former England skipper sat out the November internationals due to a knee injury and has played just four matches since returning in January. Bath wing Joseph spent nine months out with an ankle issue and, having also made his comeback in January, has appeared just three times for his club this season. Email “Itoje, Robshaw and Joseph return to England squad”. Feedback on “Itoje, Robshaw and Joseph return to England squad”.